Microwave the popcorn, following the instructions provided by the manufacturer and set aside some popcorn to garnish the Quick Pops. Microwave the milk for 30 seconds. In a medium bowl, combine all ingredients then stir and soak. Let the bowl cool and allow the butter to float up to the top. Once cooled, strain the mixture out through a fine mesh sieve. In a saucepan over low heat, pour the can of sweetened condensed milk, stirring constantly until it browns to a light caramel color. Use store-bought caramel sauce, sold in a bottle. Insert the sticks into the Zoku Quick Pop Maker. Insert sticks and pour the Popcorn base into each cavity until you reach the fill line. Let freeze completely and remove the pop with the Super Tool. Repeat with remaining pops. 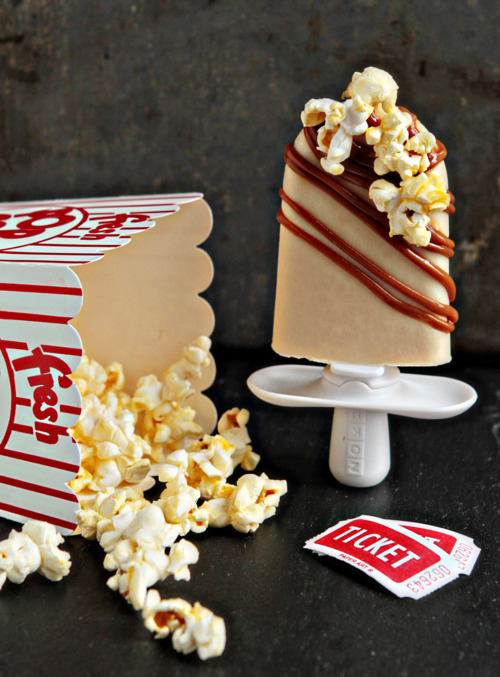 After removing the pops from the Zoku Quick Pop Maker, spoon the Caramel de Leche topping and drizzle over the pops. Garnish with popcorn to the top and enjoy! Zoku is a registered trademark of Zoku, LLC © 2019 All Rights Reserved. Complete the form on the right to contact us and we will respond as soon as possible.